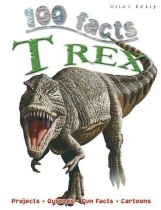 100 Facts T Rex is the ultimate children's dinosaur book! Bursting with exactly 100 fascinating facts, unbelievable images and fun activities, kids will learn everything they need to know about one of the most powerful predators of all time.100 Facts T Rex covers key topics about this dinosaur king in simple numbered facts. Every page features fantastic illustrations and photographs that support a child's understanding of the text. A perfect children's dinosaur book for budding palaeontologists!